Last post, I talked about our teams Alumni 5k. It was a very successful race. But for me, I have to leave the joy of winning in the past. I think sometimes people reflect on the past a little too long. We can't live in a life where our memories outweigh our dreams. That would mean we are living in our past, and right now, there is nothing more important to me than my future. With that said though, I am taking one day at a time, articulating a plan for each of those days to get the future, which for me is one goal that will take place on November 21st. Since the race, running has still been great. I recovered well over the weekend, even with an 18 miler out at Hangover. I really believe the sleep pattern I have right now and the amount of times I have spent in the ice bath have speeded my recover to amounts I cannot even describe. It is always the small things that make a difference. Wednesday I woke up and ran an easy 6 miler in the morning. Later, we had our first interval workout of the year. We did 3 x 2 miles with 4 minute rest and a minute jog in the rest. I figured going in, that this type of workout played into my hands better than any other workout we do throughout the course of the year. Plus, it is on our grass course, where I love to get the legs spinning. The first 2 mile, Linkous, Corey, and I led through the mile, at 5:03. I was surprised at that because I did not think we were going that fast. I ended up coming through at 10:17. The general trend for everyone is that the second mile was slower than the first one. That is not uncommon with this team, we run hard, at all times. The second 2 mile, I was a few seconds back from the front group at the mile, at 5:13. I then tried to push it harder on the second mile to bring our guys through and finished it at 10:29. So, 5:16 was my second mile, closer to an even split. The last 2 mile I took the lead from the start. I had 8 seconds on the group at the mile, 5:08. The second part of the interval was much slow, as I came through at 10:40. Even though all my intervals got slower, I was very happy with the workout. The weather was very hot, 90 degrees. What I liked about the workout was the way I ran each interval. The first one I was with the front group at the mile, second one I was a few seconds back, and third one I was in the lead. So, a different style of running one each, all getting the same finish in front of the group. This workout made me feel even more confident about my level of fitness. Today was our recovery run. Shane, Dirk, and I drove out to the forest to get a light run on trails in. It is always my favorite thing to do midweek: get out of Portsmouth and the concrete runs, and get a soft footed trail run in! The run went good. We probably picked the worse trail possible for today. We parked at the pond on Pond Lick Road and headed out to the trail on the left. It was very grown over and briars were very thick in some areas. My legs are very itchy now and scraped up. The good parts were the up and down hills. They were nice and clear. But, the run was very good. Dirk fell on his first run at the forest. Everyone falls at least once out there. Milkshakes were a great reward afterwards! Now that school has started I really have to focus on my running. I actually have been planning my day out the night before in order to plan out time to run in the morning, get ice baths, lift, and all of that stuff. I am finally trained to go to bed before 11 every night. Well, it has only been 3 straight nights, but I think I will continue doing so because I feel so good in the morning! I have a couple classes that will be boring but my two Sports Management classes are going to be fun. School is always school for me no matter how hard I try to enjoy it. I like to read, but when it comes to reading about the Rise of Gilgamesh, I could care less. So, now that I am on a routine schedule, my days are pretty much a constant flow. I already have time periods set out for the things that are going to help my running. I am VERY determined right now. I really am. Today marked one the most pivotal traditions for Shawnee State Cross Country: Hangover Time Trial. This consists of, in my opinion, a 5 mile time trail on the hardest course in Ohio. 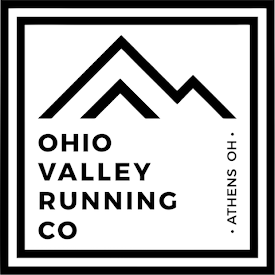 The elevation changes on this run is unmatched by anything that can be found in Ohio, rising up to 1,200 feet in spots and dropping to 600 feet. It is located about 20 miles from campus in the Shawnee State Forest, on Bridle Trail #5. To give an idea of how hard this course is, there have only been 3 people in the history of Shawnee State to break 30 minutes on this. Keegan Rathkamp has the course record at 29:02, Erock has ran 29:30's, and Chris Roush ran 29:30 or under. Keegans regular 8k pr is 24:37, so this course is about 4:30 harder than a regular course. That list changed today. The two years I have been in college, we have left the campus at 5:45 am and started our run early in the morning. This year, due to medical physicals needed by the team, we waited until late. We planned on 4 pm, but that changed to 7 pm since the temperature was nearing 85 during the day. Luckily the rains came and it was a damp 75 degrees by the time we got started. We ran our warm-up, which is uphill for a mile and then downhill for a mile, and got ready for the time trial. The rained had stopped at this point and we all started pouring water over our heads and getting our last second sips of water. Some thought the course would be real sloppy and muddy but the course held the rain very well and it didn't affect the times at all. If anything, the rainy weather caused faster times. The first mile was relatively moderate. It was a very slow start, no one wanted to take the lead, but our assistant coach, Blake Jones jumped up front and did a good job of getting the race rolling. Shane, Blake, and I came through the mile at 5:58, my first ever sub 6 mile at Hangover, and the rest of the pack came through behind us at 6 flat. After that the pace was picked up a little more, with Blake and Shane leading me by a step. I kept thinking I was going to fall off because I was having a hard time getting back in the lead; I didn't want to make them think I was just drafting off of them, but I really was trying to get up there. It was us three at the 2 mile, it was about 5:46, a total of 11:44. I couldn't tell where anyone else were, I did not look back much during the race but I imagine most of the pack was 15 seconds back or so. Shortly after the 2 mile mark, Blake dropped off a little and it was now only me and Shane. Me and Shane continued through the 5k mark at around 18:30, a time faster than my 5k time trail times in the past. Our third and fourth mile were most likely close to 6 minutes flat, or a little above. I checked my watch but my mind was to into the run to determine the mile splits, and now I forget the times. Coming through the 4 mile mark, a mile left, I think we were both aware that we were going to break 30 minutes, and join the list, but by how much. By this point, no matter who you are, you are simply running on guts or dumb legs. The last downhill, about 800 meters left, me and Shane we flying, knowing the finish was very close. We were not trying to beat each other at all, due to a mutual respect, but we were both trying to run the fastest time we could. We were just running together, at a very high speed, and neither of us would drop off. I had the feeling of dropping of several times, and later Shane said he felt the same way, but we kept going. We finished the last downhill and a 400 meter uphill, and right hand turn separated us from the finish line. The finish line felt like it took forever to get to after rounded the last turn. Felt like that little incline was just going to never end and we would never get to finish. But, as we kept increasing the pace, we finally made it there. Both crossing the line, side by side, at 29:33, earning us a spot on the list described earlier and having the third fastest time on the course. Out last mile was well under 6 minutes, completing a very well ran race. We gave high fives and congratulated each other and were defiantly glad to be finished. Shane and I weren't the only ones to run good today though. Unknown to our knowledge there were other guys behind us, and gaining. Corey also joined the sub 30 list, coming in at less than 20 seconds behind us at 29:51. Hornick came in fourth with 30:06. Joe was after that, and then Eric. There were also many guys in the 31's. Running under 32 is an amazing time at Hangover, I even think a time under 35 is impressive. Linkous, Galen, and Kammler we all in the 31's. Hickey, Little Hornick, Holbrook, and others were in the 32's. So, this was the best result of any Hangover Time Trail in the past. Another great run was by Blake Wysocki. He was right with Linkous with 800 meters to go and sprained his ankle and took a hard fall. I think he would of finished under 32 as well if that would not of happened. He did finish, but with some scrapes on his back, he looked like he was in some pain. Corey, Shane, and I talked after we all finished and took our heart rates. Mine was 30 and theirs were 33, for 15 seconds. That is a heart rate that we normally have after a regular run. So, we recovered very quickly. I might be more proud of that than finishing tied for first on the team. Having that low of a heart rate after one of the hardest runs of the year shows that running 85+ miles a week is really beneficial. Same thing to Corey and Shane. So, we all ran really well, adding 3 new names to the sub 30 list, and many more getting closer. But now, the fun was not over. We still had 5 miles to cool down and it was dark! It was also cloudy and looked like thunder. We soon found out the hard part of the day had just begun. Most of the guys took off, but a few of us started a little farther back to run with Blake, who was hurting, plus some of the freshmen were not finished with the 5 miles or just getting their breathe back. The rain came shortly after we started back and it got really dark. With all the rain clouds, not much light was on the trail, making it hard to run very fast. There was also lightening. This lightening was so close that I couldn't see anything for about 3 seconds after it stopped. Just white! It was very scary. Word can't even describe how dark and scary the cool down was. When it was all said and done, everyone on the team made it back safely. Coach headed back up the trail to find Warren, who had a rough time, and I was the only car that waited around. They finally got back and we headed home. A good finish to an even better run. This run produces many memories every year and this year was full of the them. The first run with the new runners could not have been any more epic. Hangover is truly a special run and I feel special to have it. It was a big part to our success last year and it will be again this year. *Finish Top 2 in the Conference, Beat Cedarville! Those are very good goals that we all need to keep in mind throughout the season. Doing that, will lead to great things. I am going to continue Running Free and helping the team in any way I can. Now, we have another 9 days of camp, and I am ready to have some Fun! It has been a while since I have posted a blog, since last Wednesday. My week since then was pretty busy. I made a trip home on Friday evening and when I am home it is hard to do anything on the internet since all we have at our house is dial up. It would literally take two hours to load this website! Now, Monday, I am back in Portsmouth to the modern luxury's, or maybe non-luxury's of fast internet and time wasted on it. Friday, like I mentioned, I made my way back to Meigs county. I drove through Huntington and picked up my bike! This proved to be one of the happiest moments of the summer for me. Over $920 worth and nearly three months of research and buying came to a close when I loaded the bike in my car. Building my own bike was one of the goals I wrote down at the beginning of the summer. And, this completed the checklist, so summer was a success, as it is coming to a close at the end of the week. Now, I had to wait another hour and a half until I got back home to test the bike out. I was itching at the bone the entire trip home. That is no lie. 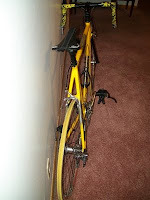 Once I got home I unloaded the bike, popped the tires back on and took it for a first time spin. 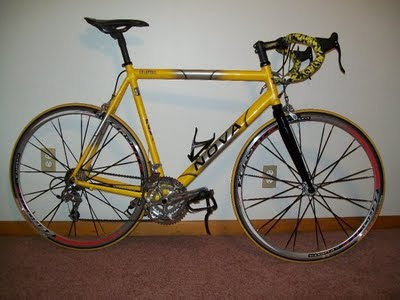 This was by far the best bike I had ever ridden. 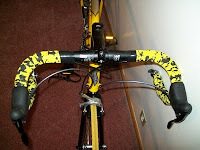 The gears worked for a change, so did the brakes, and it was simply smooth on the road and very efficient. A large upgrade from the Western Flyer to say the least. Later I road over to grandpa's house to show him the bike, the trip was fast. Later Friady night, Jon got back from work and we cooked up a delicious meal. On the grill, we had chicken with a little lemon and Italian herb topping it along with fresh cut up squash getting a little crisp. Inside, we made a fresh salad topped with fresh tomato's, peppers, soy beans, and a little balsamic vinaigrette dressing. To add to the main course, we quickly microwaved some home grown potatoes and. The meal was very delicious and it was another piece to my summer goals, eat and fix some good food. Friday at around 10 pm, I went for my run. Due to the traveling, riding, cooking, and eating, my run was prolonged to the darkened back roads of the Rocksprings area. I had planned on running only 5 miles since I was racing the next morning. But, once I got going, my legs were as fresh as fresh could be and night time running is an amazing feeling, so I ended up doing 10 miles instead. nighttime running is almost as good as running in the rain, maybe better. Strides feel smooth and everything around the road seems to not even be there, just an image in the blackened night. So, the run ended after 11 pm and it was bedtime for me! Saturday morning, I woke early and got a quick breakfast. I then headed up to Tuppers Plains for the second annual Eagle 5k. The trip up there was unusual, because the road was blurred by some of the most intense fog I had ever seen. I was literally driving only be able to see five feet ahead of me. last year at this race I got second place, behind Chris Davis. This year, he came again and brought Soorma and another kid names Matt from OU. So, the competition was tougher than last year. A quick overview of the course: It starts at the Methodist Church in TP, the first mile makes it way though the Arbould District, which had one big hill and many 90 degree turns. The second mile has two big hills, including the one that goes through the industrial park. The last mile goes through the first mile with the same big hill and slow turns. So, what I am trying to say it that, THIS COURSE IS SLOW. The race started, and the 3 OU guys, me, and Cody Wolfe, a freshman from Southern took the lead. We were all together through the first mile and a half when the freshman kid dropped off. I was surprised that he stayed with us that long. He ended up running 17:30 and getting 5th place, very impressive. So, it was just the OU guys and I for the rest of the race, which is how I figured it would be. Soon after the biggest hill in the race and the two mile mark, Matt and I fell off of Soorma and Chris. I was dead. I kept them in a close view in case I felt better at the end but that view got farther and farther away. I held off the other OU kid and ended up getting 3rd. I was 10 second behind Soorma and Chris, Chris took the win for the second year in a row. My time was 16:40, slower than last year by a few seconds, but with a 5k course comparable to All-Ohio, I was pleased. Plus, 5 minutes after the race, my heart rate was down close to a normal beat. I am in a great fitness level, another summer goal. I cooled down, received my plaque, and chatted with some old friends and the day was complete. Sunday, I woke up and quickly dressed for church. Seems like I have been in a hurry on Sunday mornings ever since I can remember. I sat in for Jeff's lesson, which was really good. After that, Brother David delivered a great sermon. After church, Mom, Dad, and I went to the Mexican restaurantn for lunch. I scarfed down my Pollo Ranchero (my normal meal there) with great delight. Food is one of my favorite things in life, all types of food. When we got home I began to pack my bags and load my car. I rode my bike over to Andrews real quick to show him my bike. Visited there for a while and road back. Loaded my bike, said my goodbyes, and headed back to the great city of Portsmouth, I met Blake to run at 7, we did 5 miles and met with Kammler and Erock at 8 to run 8 more. Except they were planning on running 12 so we tagged along. Me and Blake ended up doing 15 miles, I felt amazing. One of the best long runs this summer for me. So, the weened was a great one. Met my goals for the summer and got some quality running in. Those words have been dominating my life the past 3 years now. 'Running, runner'. That is me, Michael Owen, defined by the word 'Runner'. I am much more than just a 'Runner', but that is what people see me as. And I will take it. Because, I enjoy Running Free; this is my life.